Lizardman teams main advantage is their speed and the Skinks possess this in abundance. At MV8 they can be really hard to pin down, especially as they also have the Stunty skill to ignore tacklezones when they dodge. The Dodge skill combines with this really well to give them a fantastic ability to move all over the pitch. You do need to be somewhat careful though as they do still only have an average agility of AG3. They do have their drawbacks though and this is most apparent in their low strength. With only ST2 they can appear to be a bit useless at times, having trouble to hit almost anyone. Their low armour value and Stunty can also make them rather fragile, though Dodge offers some protection. When it comes to skill access as well they can only take agility skills on normal rolls. As they also don’t start with any ball handling skills, this can make ball handling somewhat troublesome. With their stronger team mates having the really poor agility of AG1, you are probably going to be doing all the ball handling with the skinks, though passing plays are probably out of the question due to the negative side of the Stunty skill. All these factors combine in making it a rather attractive tactic of hunting down the Skink players on your team to really hamper you. They are easy to hit because of their low strength, break easily cause of low armour and Stunty and if you have none left then you aren’t going to be able to handle the ball or move around that easily with the rest of your team. Ideally then you want to try and protect the Skinks behind the rest of your team and keep them from getting hit. So I’ve probably made them sound like horrible players by now, though this is far from the case and they can be developed in a few different ways to make them even more effective. I mentioned that they can’t really pass, though with high movement and agility access to get the Catch skill, you can do running handoff plays and move the ball quite a distance anyway. Do this well and you can probably move it just as far as teams who do so by passing, as I said speed is you main advantage. There are other great combos you can take as well for defensive duty too. You will need a couple of these, perhaps even 3 or 4 eventually and you should be able to move the ball around really well when you do. Catch is the first skill to give them so you hand off the ball to them, you also get two chances at catching bouncing balls and interceptions which is handy as well. Sure Feet next up will let you move 10 squares fairly reliably which will really open the pitch up. Both of these skills also have the extra benefit of saving your team rerolls which is great on a team that tends to need them. Side Step is probably the best remaining skill as it makes it hard to pin them and in reduces the number of dodges and blocks they will have to suffer. On doubles Block is probably best, really makes them hard to knock over and increases their survivability, will also let you do the odd one die block or blitz with less risk as well. Sure Hands could be handy should you get another one, or perhaps even as their first skill (then you might skip taking Catch) so you can pick it up and then hand off to the other ones. Any stat increase could be useful, ST3 with Stunty you can use then look to turning them into a long range blitzer, +AG and they will really be able to move anywhere on the pitch at ease and be great for ball related activities. On a 10 roll I may skip it early on and take a skill though +MV will give you an even greater scoring range, or +AV could be helpful to keep a valuable one alive a bit longer. These guys are a real pain for opposition teams to deal with and only need two skills to be effective. I’d get at least two and 4 will really cause trouble for the other team. Side Step first of all will help with protection and also let you mark receivers well or keep running lanes blocked off. Diving Tackle is next up and it makes them better at doing both jobs mentioned. When marking receivers it will be hard to blitz them away and then Diving Tackle can either stop them attempting to dodge or even better cause them to turnover if they do. Against slower teams with lots of Tackle then you perhaps don’t want to mark the players giving them a free block on you, but just standing in the way of where they are likely to run through (easier to predict for slower players) then they can have trouble getting past them. You can also use these guys to swarm a ball carrier and make it hard for them to get the ball away. Be wary though if they have an option to just hand the ball off to a team mate. Jump Up could be a good third skill, helping to keep your high movement effective after you have just used Diving Tackle. On doubles, Block may be best as it will keep them standing keeping their other skills in play. Shadowing though can really cause problems if an opponent is trying to get away, I favour Block though. +ST will let you hit players back who elect not to dodge away and make it harder to blitz you off as well. +AG will let you get balls that get dropped or knocked loose and then let you run off with it through lots of tackle zones. +MV will let you get to receivers from across the pitch or +AV will keep them alive a bit longer as they will be taking lots of hits. nice article, I’ve always wondered whether you should always take the +1AV when you roll it. I’ve often not taken it (early in skink development) and generally that skink has died shortly afterwards lol. I’m beginning to think that with skinks, wood elves and almost any AV7 player you should always take the AV if the league is likely to be long. This is really particularly apparent now with the advent of the Cyanide game and so many people playing in the ‘open league’ which literally has no end. Survivability becomes more valuable, in a short (less than 15 games say) league the skills are likely to win you a game, which is critical to your teams performance, in an unending league, your player is far more likely to die/suffer horrendous injuries over time, so i think the comparative value of AV is much increased. Out of interest, is there any way to see what the latest published articles are? I had looked through all the player type articles a week or so ago so I only found out this one had been added when you commented elsewhere. Is there a ‘search for new articles’ or similar function? The new ones all get posted on the home page, the most recent nearest the top. The featured ones in the top section then under that are the 10 most recently added articles. Or you can sign up using the rss feed (I personally use google reader for this) or email subscription. With the slight changes to skink skillsets in lrb5, i’d be inclined to take +av when it comes up, as add survivability, especially on a skilled skink, can be a godsend. +Ma isn’t as key, as you can choose general skills that can augment your already prodigious movement. I’d still also take the double on a 5,5 though. As for skills, i think what is really missing here, is the mention of kick on a double. Whilst there are many other doubles that are definitely worth taking, you should be able to find room for at least one, and the ability to control the field is more than worthwhile (even with kick off return on the other side). I do like the idea of the passblock/diving tackle combo though 🙂 Elf catchers beware!! Sure Hands would be my skill of choice on a double, given the amount of times my skinks seem to fail. Sure Feet is what I’ve started with, but maybe it’s the feeling rather than the true chance a skink with it has to fail two gfis. Prior to that the idea is good, though. Reliable GFIs are great for skinks when all they really do well is dodge and run. Addendum: I play the computer game (and rather amateurishly). I’m not a very experienced coach, especially with Lizardmen. And I find them challenging to play. Let’s say I have a few more losses than wins 🙂 But i really like Lizardmen. When moves like tunnel strike and such go according to plan, there is nothing more revarding than playing them. Up til now, I think they are kind of bound to the far ends of the scales. They either perform extraordinarily well, or stink to high heaven. I would love to find some sort of detailed lizardman playbok. Making my own is very time consuming. Or at least a “Skink use 101”. By the way: Fantastic page, coach. It is certainly a viable option, though if you are going to make a skink fouler I’d wait for a double on the first skill to take dirty player and then you can take sneaky git next skill regardless of what you roll. If you take sneaky git first then you are leaving it to chance that you get a double on the next skill to get Dirty Player. The reason I don’t really advise building one initially is because double rolls on a Skink are at a premium and there are so many more useful alternatives. Block, Wrestle, Sure Hands, Kick and even Tackle or Strip Ball if you roll doubles again on the same one. Also Skinks aren’t the cheapest of players and while you are right they tend to leave the pitch easily, I prefer not to accelerate that by getting them sent off. A fouling Skink is probably most useful on a fairly old and developed team where you have most of the other core options already covered on your other Skinks. I’ll get around to playbooks eventually but Blood Bowl is quite complex from a strategy point of view and it may take some time to get around to covering it. Lizardmen are also probably one of the more tricky teams to use well due to their skill access, stating skills and stat lines for their players. Until then hopefully the more generic articles will help you somewhat, though as always if you have any in game situation you feel unsure about, recreate it on the play creator site and post it on the forum. Skinks can make good catchers with their agility skill access but are terrible passers because of stunty. Stunty can effectively be ignored however by a skink taking Hail Mary Pass on an early double followed by a few others taking Diving Catch. With the high movement of skinks this can turn most opponent ball fumbles into 1 turn touchdowns for you. In general I kinda disagree on skilling up multiple Skinks with catch. To me, scoring with Skinks is so easy that they do not really need any additional help. Also, ” normal scores” (when you receive with 4 or more turns to go) should imho be done with Sauri (AG1 pickup with a reroll is 55%) anyway, since those are incredible hard to skillup otherwise. I also disagree on choosing shadowing on a (second)double. IIRC, you have to choose between using shadowing or diving tackle (unless you can first attempt to shadow and use diving tackle if this fails), I find that Strip Ball can be incredibly usefull on a Skink that already posseses Block. Also, Guard should be considered, as this will often allow you to get 2 Dice Blitzes with Skink Mobs. I would also recommend to perhaps build up a one turn scorer skink, who should get Sprint, Sure Feet and Catch, in any order that suits your fancy. Lizards are among the best one turn score races in the game (second only to Skaven and Wood Elfs), due to having Stunty, often having Frenzy, and MV8 to boot, so it would be smart to exploit this. When rolling a 10 (non double) I would go for MV on a “Scorer/OTS” Skink and AV on an “annoying” Skink. One should also consider Kick as a double, since Sauri usually have more pressing Skill needs and Lizards really benefit from Kick a lot. As a third choice after Sidestep DT, Sure Feet could also be considered. Basically, Jump Up gives +3 MV after having fallen down, while Sure Feet allows to do GFI without much risk. If you are trying to create a Skink-Seperation between an enemy ball carrier and his main team, having those extra moves may be huge. Thanks for that some good points there. Regarding Shadowing and Diving Tackle, you resolve the dodge first in which you may or may not use Diving Tackle. If they succeed in dodging away and you are still on your feet, then you can try and use Shadowing. That may force another dodge attempt where you repeat the same procedure. Hmm, perhaps an article on how to score with Sauri may be in order, since this is what creates succesfull Lizardmen teams. One can do 2 things, either one does a pickup with a Saurus deep in your own zone, or you carry the ball with a Skink and hand off in the deep in the opponents zone. The prefered matter depends on your team, your enemies team and the available threats. Against Dwarfs, a pickup in your own zone is prefered, since they are likely to slow to profit from a pickup fail. Against Skavens, handoffs from a Skink to the Saurus are better , because you will have more way to insure that a hand off fail will likely land in or next to your cage. Legend: SK = Skink, SA= Saurus, SH= Saurus handoff target, SB= Skink Ballcarrier. If the handoff fails, the ball will likely drop in at least 2 tackle zones. The next problem is avoiding to be marked while beeing a non BT Saurus Ballcarrier. To combat this, you have several options. 1: Blitz with the Ballcarrier and do not follow up. 2: Blitz with someone else. Both of these are rather straight forward. However, often those markers will have sidestep, perhaps reeinforced by Diving tackle. Also, you may be marked by multiple guys, meaning that a single Blitz wont do. In such situations, use Skinks to set up a chainpush. Sidestep does (in LRB 4 at least) not work against chainpushes, meaning that such a chainpush is an ideal way to get away from a sidestepper. If Sidestep works against Chainpushes, a marking non sidestepper into you ball carrier and get away from the sidestepper by this. P.S. Is there a way to add pictures? +AG is godlike on skinks, and if you can roll one or two of these your team will never be the same again. You won’t need nearly so many attacking skinks, and catch becomes a lot less important leaving you able to take sure feet and side-step earlier. Re: Defensive skinks – I think I’d take sure feet on the third skill. While jump up may seem to combine with diving tackle it’s quite rare that diving tackle actually sends you to the floor. Sure feet gives you extra general mobility to give assists to players trying to take down the ball carrier. It’s a close call though. On defense I’d recommend having at least one attacking skink on the pitch (you never know!) while for attack I’d suggest only having two. The defensive skinks are very useful on attack as well, as they can mark dangerous opponents and sit in channels. If bad things happen attack can turn to defense pretty quickly too! I’m new at blood bowl, however I beg to disagree with the assumption that skinks are terrible at passing, while they start out with only a fifty percent chance of making a throw, taking passing or accurate makes passing a possibility, even if most teams will make it hard for you. Moving 8, a quick/short pass and moving an additional 8 and maybe going for it usually gets me a touchdown. You will soon find that against good coaches relying on a 50 50 shot will lose you games. Compared to just doing a hand off (which with movement eight, Dodge and Stunty should be feasible) the odds are awful. Doing a quick pass and a catch is 33.3% or 61.1% with a reroll. Doing two go for its and a hand off is 46.3% or 77.2% with a reroll. Passing should generally be considered a desperation play which is why you will find most games often end without a single pass attempt unless trying to get a quick score at the end of a drive. Even doing one dodge with the Dodge skill, two GFI and a hand off is 41.2% or 68.6% with a reroll. Hope this helps! Even handoffs are risky with AG 3, and at least then you can predict fairly well where the ball will go if you fail. Also, if you’re going for the Skink passing game you will necessarily have to expose your Skink receivers, and most teams will have Tackle and/or Mighty Blow specialist eager for a shot at farming Stunties for bonus SPP. Sure you /can/ pass, and there are (losing) situations where it might be your best bet, but generally speaking if you’re looking for a mixed passing/running game there are other teams much better suited to it. The only time a lizardmen player should ever attempt a pass is if it’s Turn 8, you can’t or don’t need to score, and you’ve got a Saurus or Skink at 5, 15, or 30 spp with a Catch skink ready and waiting. I’m 10 games into my first Lizardman team and I love them. I’ve completely lucked out with a skink with 2 +AG rolls. With an effective 4 AGI for passing, 1 turn TD is pretty simple on a turnover. I keep him in the back field to pick up the kick and as my ‘safety’ in case of fumbles. Good times. My best ever skink play was actually made with a pass and completely ignored the effects of Stunty. I was backed up against my own end zone with the enemy closing in (I’d knocked the ball free just before he could score) and there was no way I could get the ball to an unmarked square by running. So I ran 2 empty-handed skinks up through his lines as far as they could go, leaving them both unmarked, then had the skink with the ball make a blind throw as far up the field as I could, sort of like Hail Mary Pass. Sure it was a turnover, but that didn’t matter. Next turn, the opponent couldn’t reach the ball and could only blitz one of my 2 skinks; the other one broke free of his mark, picked up the ball and scored. I’m surprised you didn’t suggest taking Dauntless on a second doubles roll for a ball sacking Skink, Coach. It seems like the obvious choice when you’re trying to blitz a target stronger than you. With only agility access for Skinks there are a lot of great and useful skill choices for them to take on doubles. Dauntless would be handy, though I think other skills are going to be more useful more often. A Lizardman team also usually have 7 ST4+ players, I don’t really think you need a ball sacking specialised Skink, especially given the need for multiple doubles to build one. My first Skink rolled a double. My immediate thought was Sure Hands, but now I’m thinking Leader. I’m surprised not to see more people suggest this. Is it just because Skinks die easy? It’s because there are better options to take, like Block / Wrestle, Sure Hands. A Leader Skink would also be hard to protect, it’s a better option on a Saurus but I don’t really think Lizardmen teams need Leader. Thanks for the reply. I don’t have much league experience, so the discussion here is useful. Ignoring for the moment that Sure Hands protects against Strip Ball, I was thinking I don’t normally have that many attempts to pick up the ball and it only gives a re-roll for that particular Skink – useless if it’s the wrong Skink. Leader lets me re-roll one attempt at anything (picking up, catching, blocking, etc) with any player. If it’s worth 60k for a team re-roll, then it seems worth a double skill (which counts 30k towards my team rating). As for Saurus, I’d have thought there were more useful skills for them (Block, Break Tackle, Guard – probably Dodge on doubles), whereas Skinks are relatively plentiful but don’t have a great choice of skills. There are plenty of useful double skills to take on Skinks though, I agree there are also plenty of useful skills to take on a Saurus, hence not taking Leader at all. You have a lot of in built rerolls with Dodge on the Skinks, otherwise your Saurus are usually blocking. So you don’t have a massive need for a lot of rerolls. However both your player types don’t really start with much in the way of skills and your team has a great need for them (imo). On Skinks, you have Block or Wrestle which makes them much harder to kill. With Stunty they can dodge in a lot of places you wouldn’t want to do with a Saurus (even with Break Tackle) and they are also faster. Wrestle and Dauntless are therefore useful, Guard as well on another is going to be a big help (a Skink with MV8 and Dodge can get a lot more places than a Break Tackle Saurus). Even Tackle can be useful to have on a Skink (though I’d want Block first) for building a Side Step + Diving Tackle defender. You can also make great use of Shadowing with their high movement if you were to roll doubles yet again. Obviously there is no right answer so if you feel Leader is going to help you more then take it. 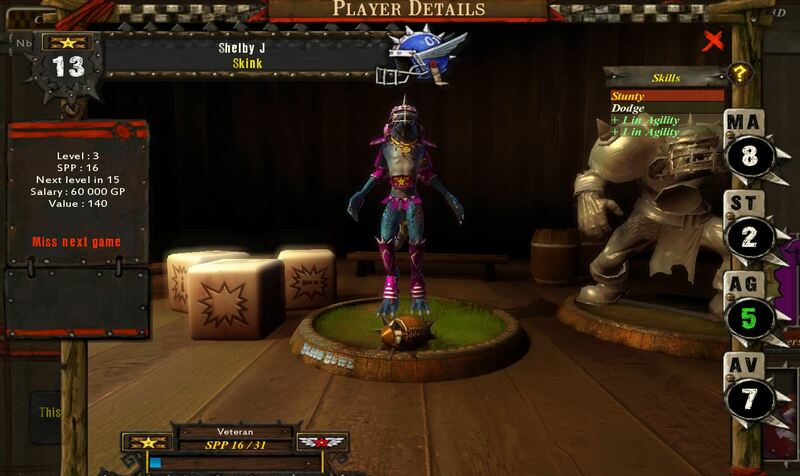 For the way I play I’d rather take the skills, though as with most decisions in Blood Bowl your mileage will vary. That’s just the logic I use for not taking Leader. Though historically I’ve never been a big fan of the skill. I can just save up more and buy a team reroll whilst a lot of skills you can’t replicate with one, even though it can save you a bit in team value if you took Leader. A team reroll also can’t be lost by one of your fragile players being injured and against higher team value teams it becomes a lot harder to hide your Skinks. Thanks again. I’d mainly been comparing Leader to Sure Hands (and ignoring the protection from Strip Ball), thus thinking a re-roll more useful. I agree that there are other skills that can’t be replicated, so maybe I should think about those. Coach lets not forget the throw away skink. Stat increase AV always a must with diving tackle and a great fouler that can avoid getting caught a bunch of the time. I skip ST and go for the Double skill unless I already have dirty player as a single skink with +1 to foul is an amazing guy. Jump up after sneaky git just so you can get up and run an foul those pesky pains off the pitch. You take side step for the obvious reasons, jump up to keep them mobile and ready to pick up a ball or give assists, catch for your hand-off plays, diving tackle for more reliable marking, and leap for those moments when it would be less risky than dodging through multiple tackle zones. The first double roll is a matter of taste, on one hand block keeps them on their feet more and can cause turn overs but with wrestle you counter block and the movement penalty doesn’t matter with jump up, fend can help keep them alive when against frenzy players, and guard can be useful to get assist for other skinks and the saurus. All stat increases are nice but it comes down to your play style, ST if you plan on blocking more with them, AG to help with leap and ball handling, MV to make them more of a scoreing threat and to make it easier to lend assists, and AV to help them take more hits. I´d like to add some advice on firing skinks, especially in matchmaking leagues like Auld World of the Cyanide game. b) keep the TV of the team as low as possible. To do this I recommend to play with only 11 players. This lowers the TV and increases the chances for a Saurus-MPP to 6-5. The other thing I recommend is to fire skinks quite early in the game – if they reach Lvl 3 without getting a double. Of course only, if I can afford to buy a rookie replacement. I really am hoping for a +AG skink, and the earlier I fire skinks, the earlier I will get lucky on that skillup roll. An +AG skink is a gamechanger in play – he picks up the ball reliable and soon threatens to score with dodging through the opps tackle zoneson one flank, whilst being well protected by the saurii. If the opposition puts more TZ before him there remains the option of running over to the other flank with a fairly reliable handoff to a Skink with Catch. After a diagonal run by that skink most slower teams will not be able to stop him from scoring. On doubles I recommend a DP once the TV gets higher. The Kroxi and the Saurii are vulnerable against Pombers and Clawpombers, and a fast team with a dirty player will make them think twice before the standard piling on move. My league had a very good coach who swore by having 1 Skink with Hail Mary Pass – it got him more than a few victories, being able to spread out the opposition, then running Skinks up for loose screens and throwing the ball to the other end of the field from own endzone. The slower teams are caught flat-footed and can’t get to the ball, and at least 1 Skink will be able to Dodge out, if marked, and run to TD after a pick-up. As you’ve said yourself you need to catch the other team flat footed so it depends on the calibre of coach you are facing. I’d see more use for clearing the ball down the other end of the pitch than for relying on it as a scoring method. It’s not an uncommon tactic but personally I’d rather use my double rolls getting Block which is going to be more useful more often.